Schleich is now in it's 75th year of making beautiful hand painted figurines! With great details they accurately capture the features and character of each animal; making them perfect for imaginative play and collecting. The princess is just old enough now that she is really getting into imaginative play. She absolutely LOVE'S animal's. What's more she admires all thing's tiny and miniature (she likes bringing toy's along on our outings in her little purse ;). We received the Schleich Little Pet's collection (pictured above) for review, she was beyond excited when I pulled them from the package, she was immediately set to play! Aside from bringing them EVERYWHERE with her, she also enjoys using her new Little Pet's with her doll house. 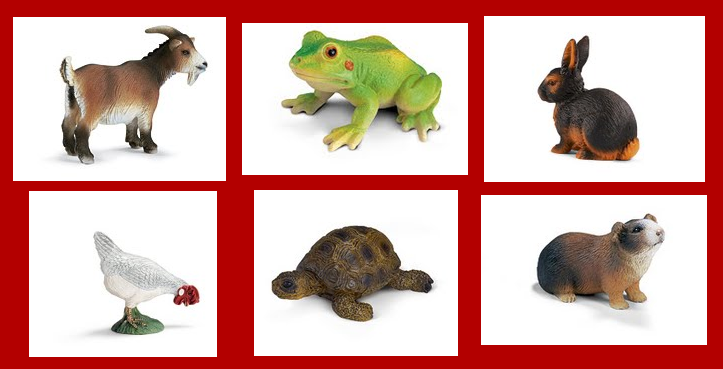 For endless hours of imaginative fun, check out the Little Pet's collection by Schleich! They would make adorable stocking stuffers this Holiday Season. You can find Schleich figures online and at a retailer near you. The PERFECT Stocking stuffer's this Holiday Season! One Lucky Reader will win a Schleich Little Pet's Collection! Leave a comment~Visit Schleich online, and let me know another Schleich item you'd love to give (or receive) this Holiday season. The comment is considered your entry. Entry to this giveaway ends at 12pm PST December 14, 2010. Winner's are chosen randomly through random.org. The winner will be announced in a post within 7 days of the giveaway ending, and contacted through email. The winner will have 48 hrs. to respond or another winner will be chosen. I'd love to give any of their Vehicles too! My children would love to have the baby panda. I like the Western Riding Set. I would like to give the Baby Panda to my grandaughter. i like thier little hampster, and i like thier cars or vehicles too! Another Schleich item I'd love to give (or receive) this Holiday season is the Labrador puppy. Thanks for a great giveaway!